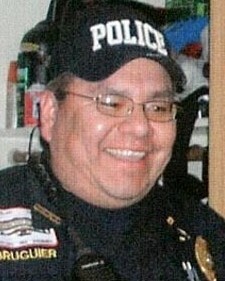 Police Officer Merrill Bruguier was killed in a single vehicle crash at the intersection of S.D. Highway 63 and U.S. Highway 212 at approximately 4:00 am. He was traveling from Cherry Creek to Eagle Butte at the time of the crash. 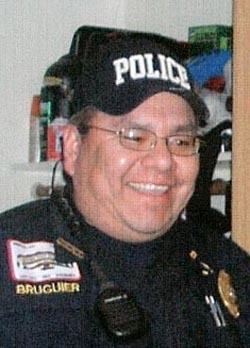 Officer Bruguier was a U.S. Marine Corps veteran and had served with the Cheyenne River Sioux Tribal Police Department for 14 years. He is survived by his wife and 9-year-old son. Its been 8 years Merrill and it still feels like yesterday. The memories and the feelings of emptiness come flooding back. You are missed everyday and on the cold rainy foggy days it is more so. Today marks the 8th Anniversary of the worst day in our lives. God decided your work here was done and took you to a better place. Please watch over your son. It was easier when he was 9 and I was able to console his broken heart. At 17 its hard to understand all his emotions and I don't know how to fix his broken heart. When you first left us everyone said it would get better with time. They lied. It never gets easier and our heartache never goes away.